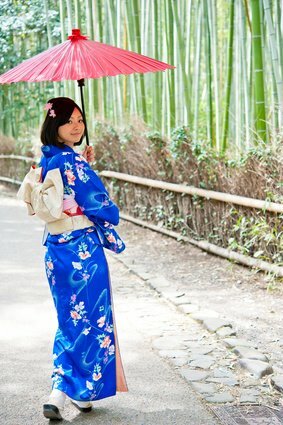 If your mother or grandmother doesn’t have a kimono, and you don’t have any acquintances that might pass it over to you, you have to purchase in order to have your own kimono. What should you choose for your first kimono? If your objective is to go out to play in private, komon or tumugi might be suitable. Komon can be used in variety of situations. You wear awase for more than half of the year, so awase’s komon is recommended for the first one. Hanhaba obi is simple and nice for obi, but some people don’t like it because they’re too formal. Nagoya obi might be safe. Fukuroobi might be nice also, but it becomes a little formal even if you selected a casual one. You need to pay attention in the choice of patterns. Patterns which include the feature of the seasons can be only worn in that season. In the beginning, geometric designs, flowers that can’t be identified, animals such as dogs or cats might be suitable, for you can wear it all around the year. Sometimes the design indicates a specifc season, though you thought it was only a geometric design, but that doesn’t matter much. Don’t worry so much about not knowing the rules in the beginning. Even if you do make a mistake, geometric designs don’t stand out compared to non-figurative patterns.